The world we live in requires solutions. This is something one comes to realize as an adult; simply talking about issues or social problems are nary an answer to tangible change. How do we recognize that we are capable as humans of directing the energy that flows through society, how do we find importance in our one singular voice? 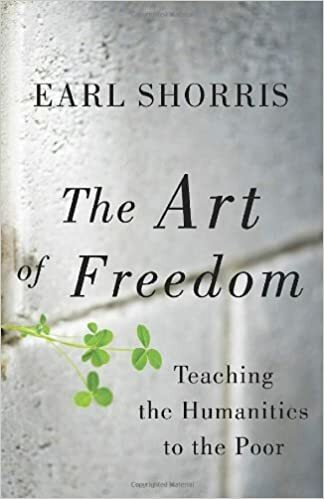 Earl Shorris, deceased since 2012, had found a way to make the humanistic ideas in his mind a reality. The Art of Freedom is the story of this idea which turned into a thing called The Clemente Course that “with a faculty of friends, began teaching the great works of literature and philosophy – from Plato to Kant, from Cervantes to Garcia Marquez – at the college level to dropouts, immigrants, and ex-prisoners” (Shorris, 2013). Shorris provided the subway fare for students to get to his class, he provided the daycare for single mothers, and in return he taught them a ‘richness of the mind’ – the politics of being a citizen as written by Pericles, and offered them a space and the tools to reflect on the world around them, the same tools given to humanities students in the finest colleges in the United States. “Will the humanities make you rich?” he asked the students, “Yes” he answered, “But not in terms of money. In terms of life” (Shorris). Shorris creates what he imagines as one approach to tackling poverty, that the ‘moral life of downtown’ is withheld from those in the poorer classes, and not by choice. This first Clemente Course is a success for Shorris and his team of teachers. Several students rise up and go on to graduate from college. Soon he looks to spread this same approach to other struggling groups. He forms a Clemente Humanities Course for Native American tribes, one for Mayan’s in Mexico, and even in Africa he slowly and clumsily creates a course for refugees from Darfur. In each instance people’s lives are improved by gaining new perspective and learning how to reflect. The Art of Freedom had been sitting on my shelf to read for a couple of years, at least. It was published in 2013 post mortem, and I found a review in a paper somewhere along the way that I tucked into another book and every so often I would remind myself that I needed to read it. It’s an appropriate time for this book and I, solutions are something I think about every day and Earl Shorris was on to something. To study what it is to be human and have a basis for self-reflection is vital to finding the richness of our minds, and everyone is entitled to this.